Finished the second car knitting slouchie using Caron X Patone. The top color was ripped back, as it had 4 decreases in it, instead of the usual 8. I'd tried it to see what it looked like, wasn't happy with it, plus I would have run out of yarn. Glad I tried it, as now I know! I didn't notice the rib on the brim was out until it was finished. I don't mind the way it looks. It just means I can't count to two! 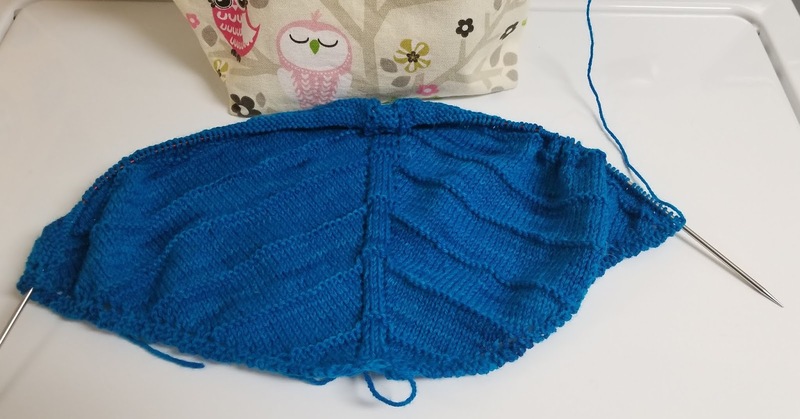 lol We have some running around to do today, so I should get a row or two in the Boneyard shawl. It's supposed to be cool today and tomorrow, so I may get to wear it. 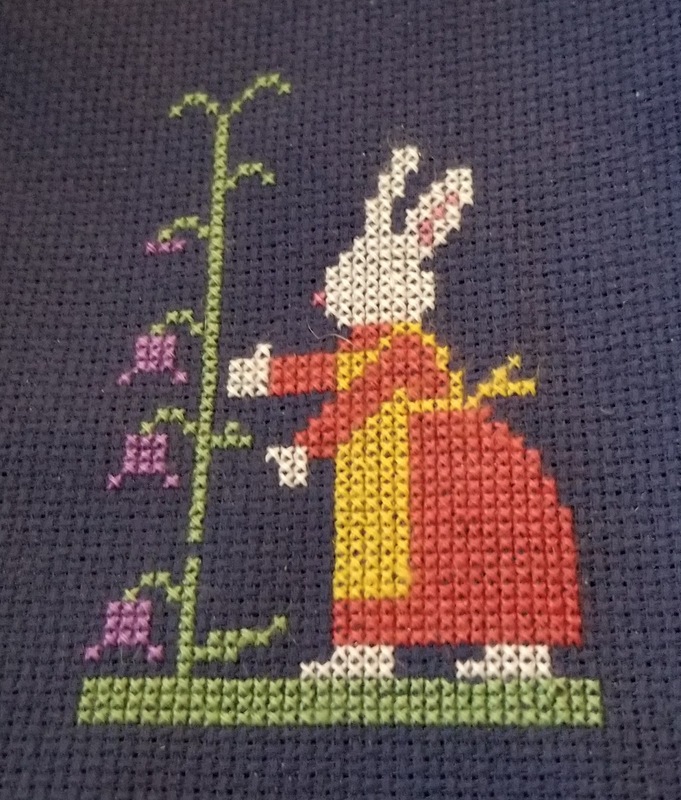 I-m trying to keep my cross stitch WIPs down, so until Flower Power - November, Peaceful Forest (both for my summer display) and Miss Mary Mack are finished, I'm not starting anything bigger than an ornament as a palate refresher. 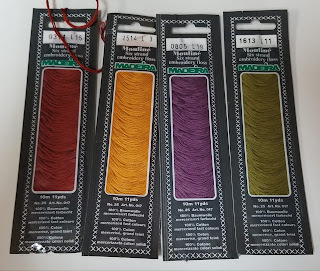 To help take the edge off, I picked up a bottle of Rit dye in neon green, at the grocery store today, which I'll use to dye some white aida for La-D-Da's Which Witch. If it's too bright, I'll add some grey, which will knock the brightness out of it. Or, dye it in green first, then overdye it using the cram jar technique. I lke purple and green together, so am thinking about stitching it in dark purple. Wolfman's quilt is half basted. It's been taking up a lot of room on two trestle tables in my craft room since the middle of February. I'm looking forward to getting everything back to rights and giving the room a spring clean. It was hand basted with some splitty thread that wouldn't play nicely in the sewing machine. The Boneyard shawl is coming along. I've made a few and with it being a very simple repeat pattern, it's easy to remember. The yarn is some discontinued (long ago) Panda merino in sport weight. It was a natural, creamy color which I immersion dyed in teal, then spread out and poured a stronger solution over the top of it, to give it the dark pops of color. 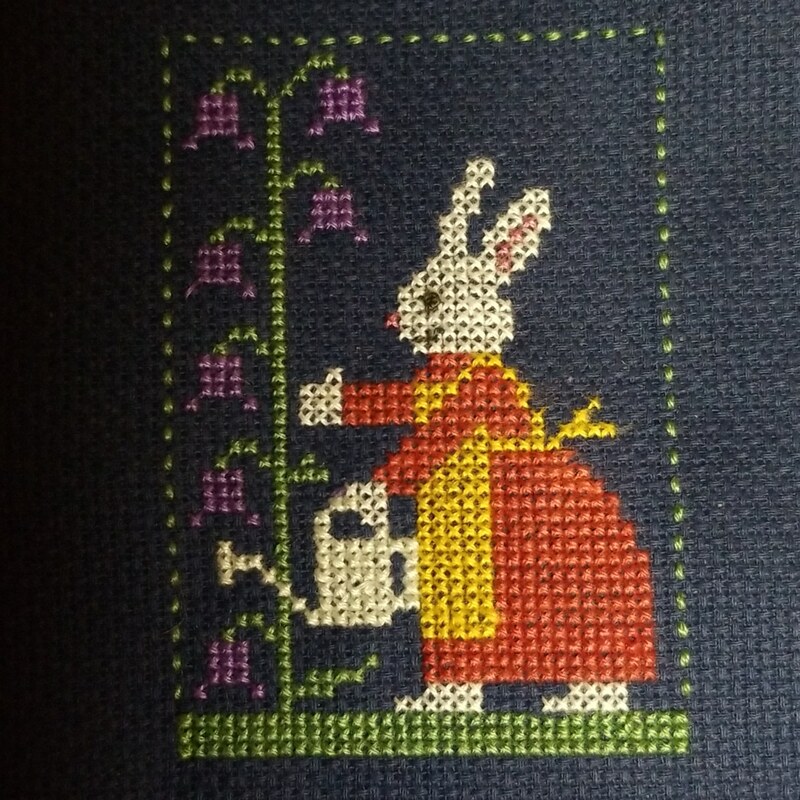 One of Prairie Schooler's Spring Bunnies is finished. I'm bunnied out....for now. Queen Bee by Prairie Schooler is also finished....as a two legged bee. I finally figured out where I went astray....I put the wings where a second set of legs should be! I'm calling it artistic license, as even with four legs, it'd be a pair short! I do like it, although the thread color is washed out in the picture. Flower Power - November Sampler was on top of the WIP pile and since I'm in the mood for stitching, not prepping for Peaceful Forest this will be tonight's stitch. It's by Ewe and I Are Friends an was first published in 2008. 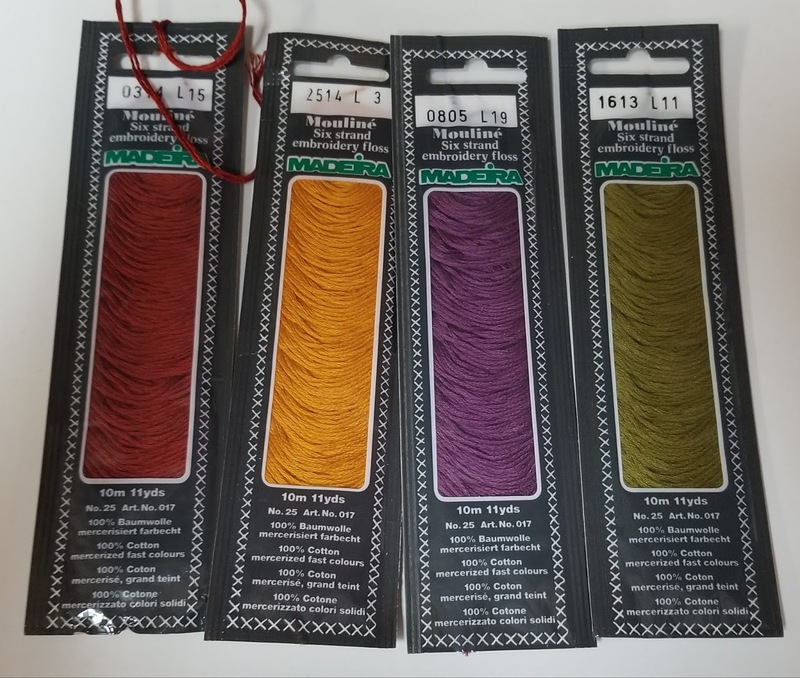 There's six colors in the pattern - four by Weeks Dye Works and two by Sampler Threads. They're all muted, so have substituted these four from deep stash, instead. The floss is lovely to use and has a bit of a sheen to it. The aida is rustic Zweigart. It's darker than shows in the photo. I'm thinking that I'll finish the vase before starting the flowers. 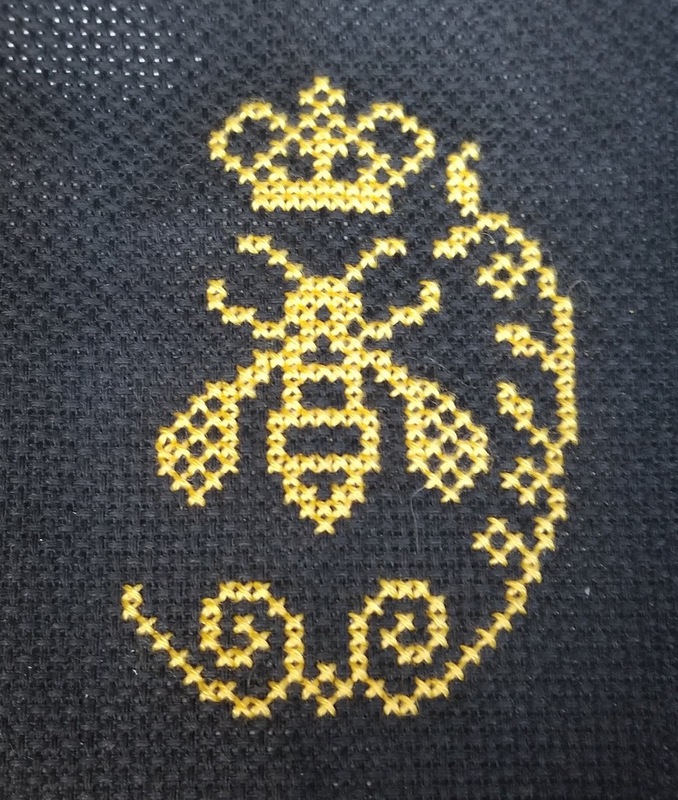 Prairie Schooler's Queen Bee is almost finished and ready to FFO. As I was stitching around the outside, I thought it looked a little odd....it eventually dawned on me that I'd not stitched the back legs. 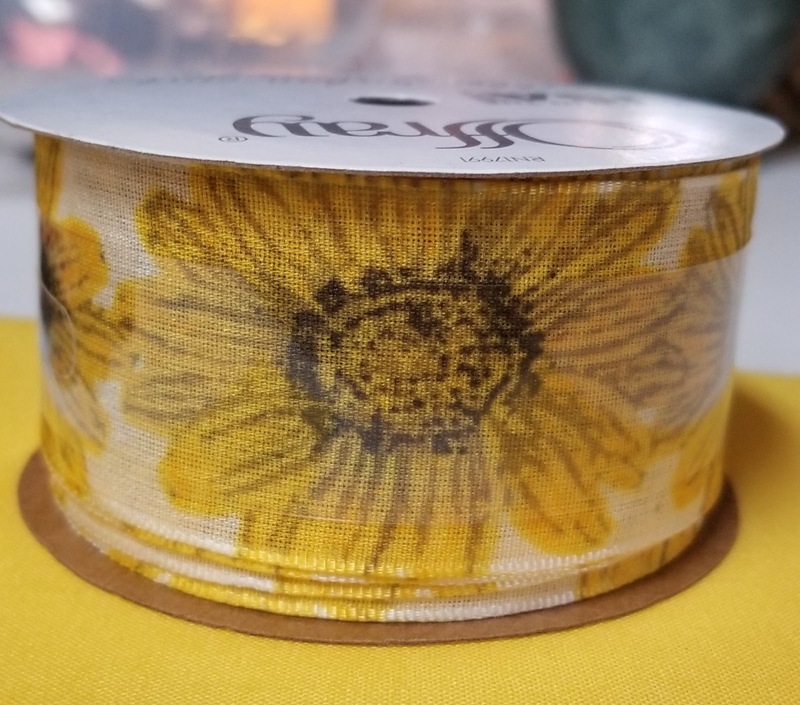 I'm thinking of using this ribbon and the fabric to FFO it. Then, it'll be tucked away until the summer. I rearranged my display a little this afternoon. 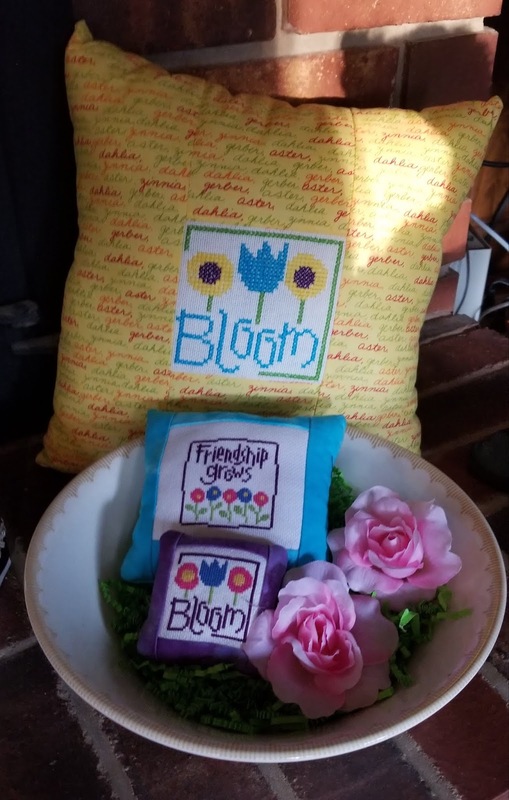 Bloom and Friendship Grows are both freebies. Hello Spring is a Lizzie Kate freebie. The biscornu pattern (another freebie) is here. Wolfman made the ginko leaves. 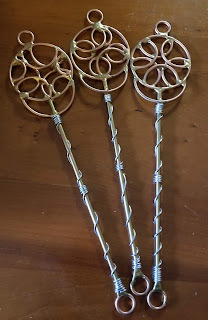 These are three bubble wands Wolfman made. The photo is a bit washed out, as the sun was shining on the dining room table. 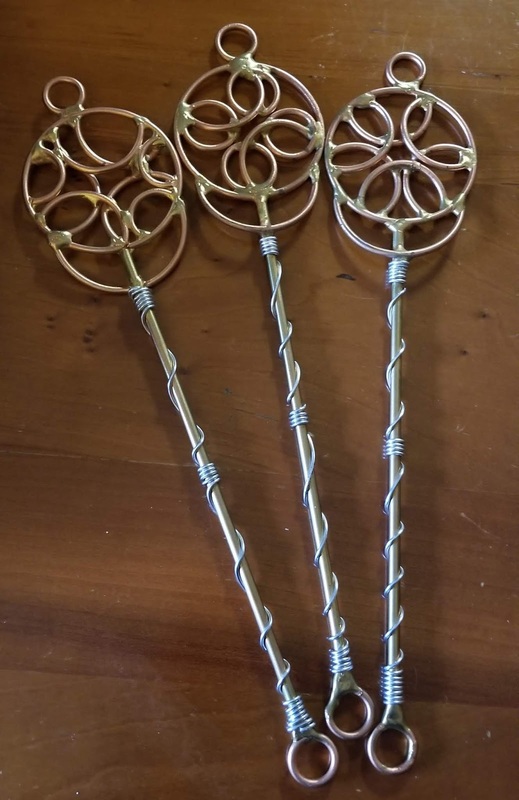 They're made from brass, copper and steel. 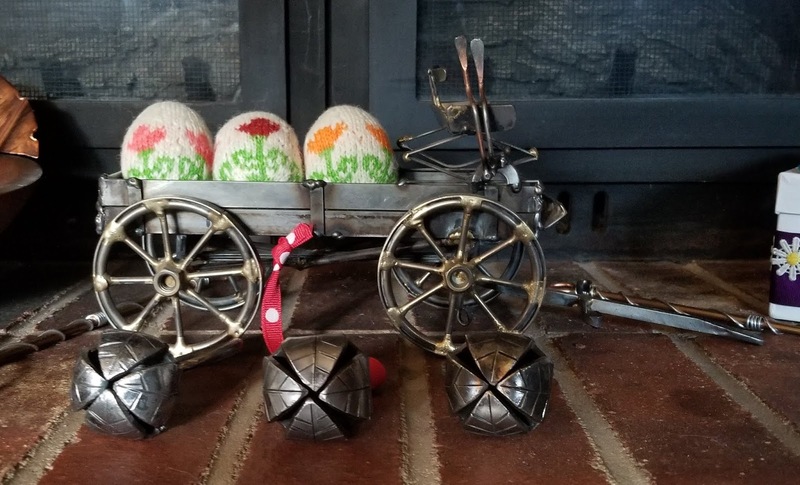 Wolfman also made the car and we made the sleigh bells together. The eggs in the back of the cart are knitted using a pattern from one of Arne and Carlos' book Easter Knits. There's Youtube tutorials here and here for a couple of different ones. The charts can be printed/downloaded from their site. This is Spring Friends by Brittercup Designs. The box is from a set of three plain brown paper/cardboard? boxes I found at Dollar General for about $3 or $4 and was painted with white acrylic paint. 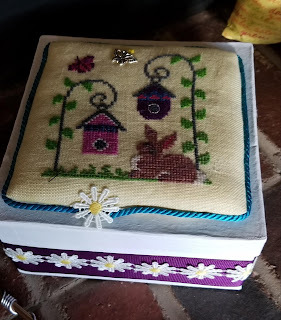 The cross stitch was finished on a piece of cardboard with quilt batting layered over the top of it. The fabric was folded at the back, then hot glued down. The daisy ribbon was hot glued onto some purple ribbon. Everything was from stash. About ten years ago, I went to a quilt show , where there was a small section of other types of craft vendors. 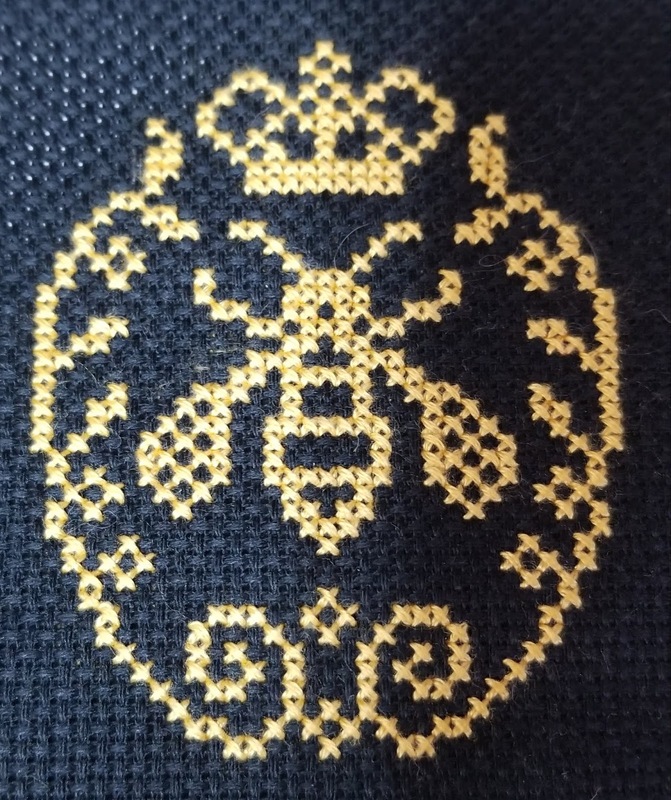 Naturally, I made a bee line to the cross stitch booth. It was a local vendor who had just taken over a business. 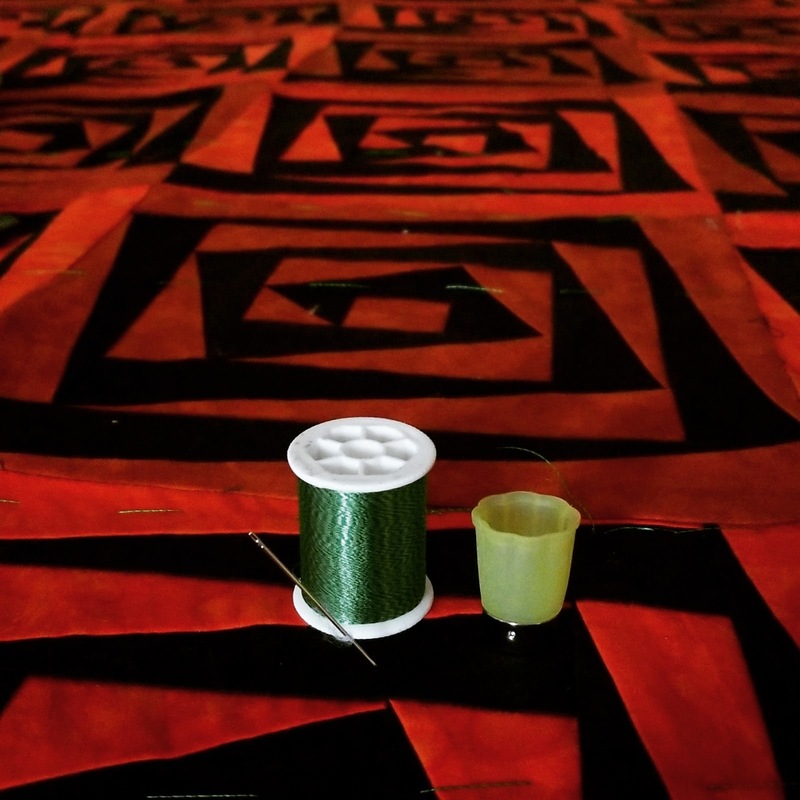 She was selling many patterns at a reduced price, but even so, business was extremely slow. I spent a good part of my budget for that show on her stall. Much to my surprise, as I was getting ready to pay, she started piling me up with additional patterns. Which is how I ended up with about 100 cross stitch patterns! So, I've decided not to purchase the three patriotic patterns I mentioned in my last blog post.....yet. Instead, I'm going to adapt some of the ones I already have. The first is Lizzie Kate Tea Crazy. Little Cups of Friendship will be fairly easy to adapt to Little Cups of Libertea (or something similar). I'll keep digging and let you know what else I've decided on. 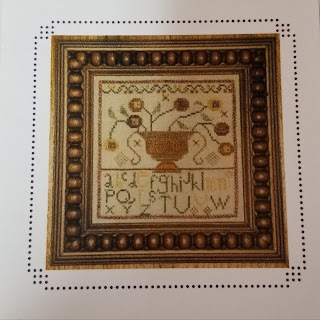 I spent a while perusing my cross stitch pattern files yesterday, looking for a small project that I could finish in a night or so. I picked out floss and cut fabric for Stitching Forever by Lizzie Kate. When I was putting the files back I spotted a small piece of paper in the tub. 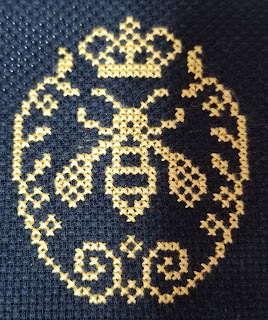 It was Queen Bee by Prairie Schooler. Lizzie Kate was tucked away for later. 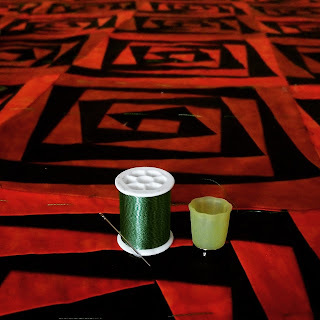 The fabric is 14 count aida from Loops & Threads. It's the first time I've used their fabric and the first time I've stitched on black. I'd not want to go lower than 14 count, even with a good light and a white tea towel on my lap. I'm stitching it in hand, but it would sit nicely in a hoop, as it's not too stiff. The thread is DMC 725....my favorite yellow. Bailey (minature poodle) snuggled under the quilt next to me, as I drank a pot of tea, listened to Harry Potter and the Philosophers Stone, stitching happily away. I've been a bit stuck for a summer stitching theme. 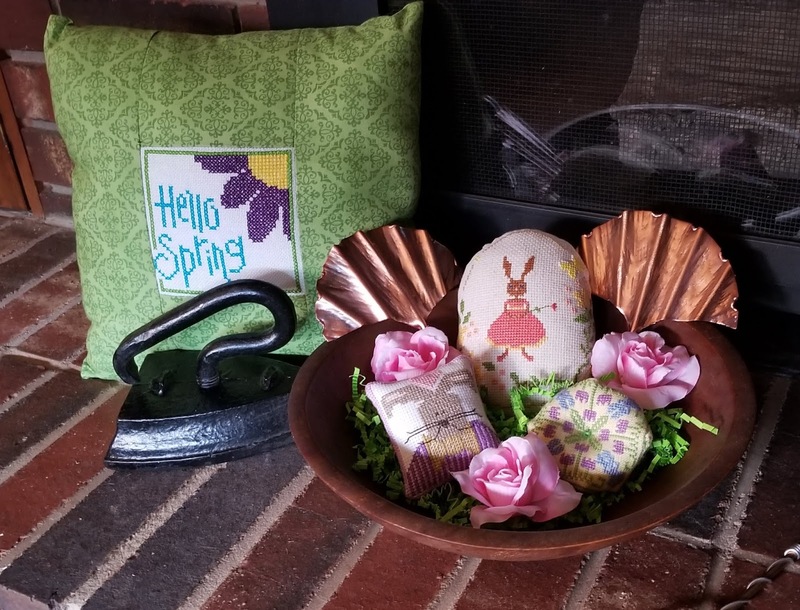 When I swapped out my winter display for spring, I came across three finished smalls. Two were bees and the third was a bird. All four pieces of She Tends by Shepherd's Bush were in there, too. Bees, birds, gardens and trees seems to be the summer theme. 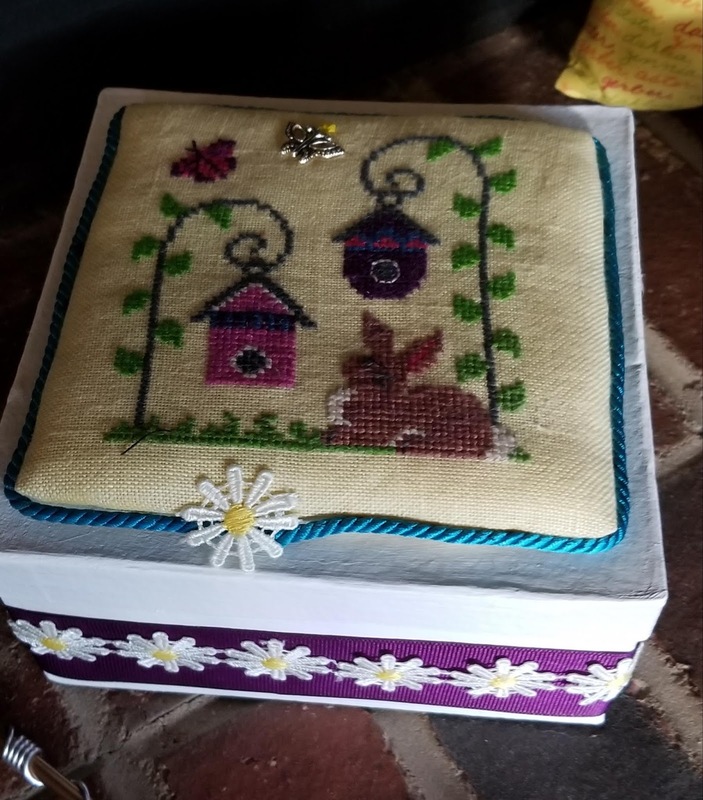 Garden Birds, plus Birds and Berries by Prairie Schooler are both in my stash screaming to be stitched. Garden Birds has eight designs. Birds and Berries has four. They'll probably be made up into pillows and sit in a couple of wicker baskets. Until I popped on 123stitch a few minutes ago. I thought I was done with Independence Day stitching for a while. That was until I spotted Sweet Liber-tea by Silver Creek Samplers and Glory by Bent Creek. There's also Scatter Freedom by Shepherd's Bush. They may just find their way into my stash and stitching rotation sometime over the next few weeks. Day 2 of spring has led to a mad dash of singing, dancing and swapping out Valentine and winter displays. Like Home by La-D-Da was started in Australia and finished here in NC a few years later. This is a mish-mash of spring themed bits and pieces which were lurking in the cupboards. There is more than what I thought and there's still room for more! 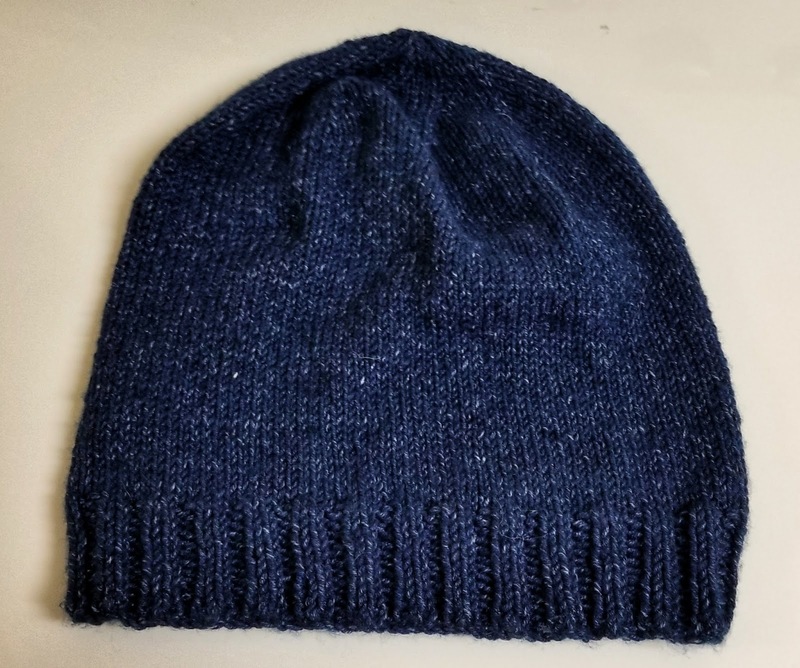 Brainless knitting has produced a slouchie using Lion Brand's Denim yarn. 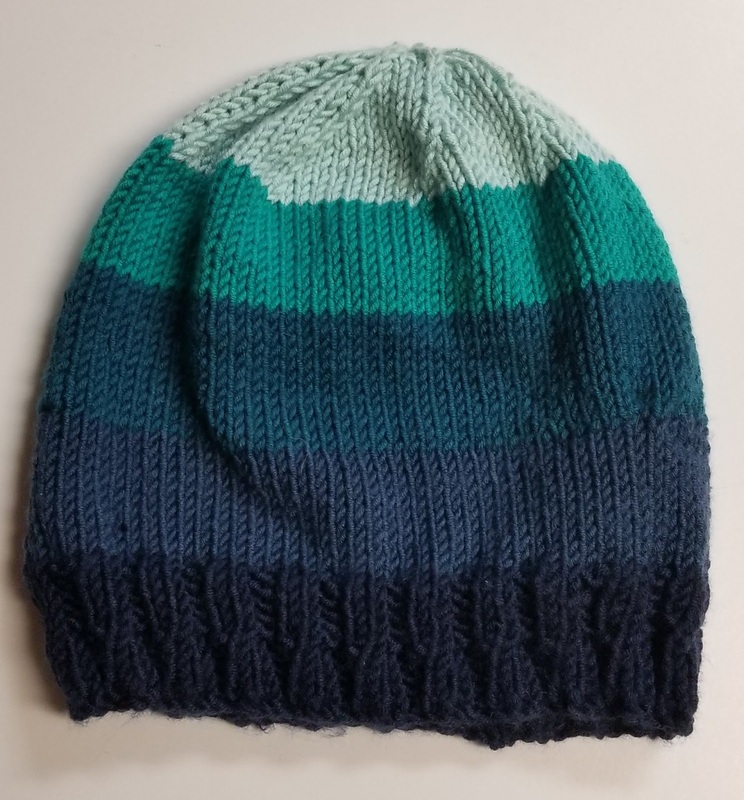 It's soft, squishy and absolutely perfect for this style of hat. 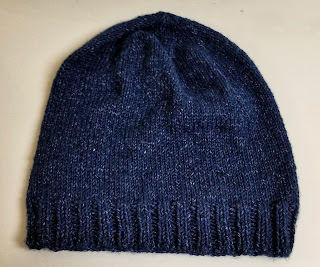 I like to squish the slouchie down at the back, not have it sticking out and the yarn worked great for that. A few flowers have been added to the Prairie Schooler's bunny. 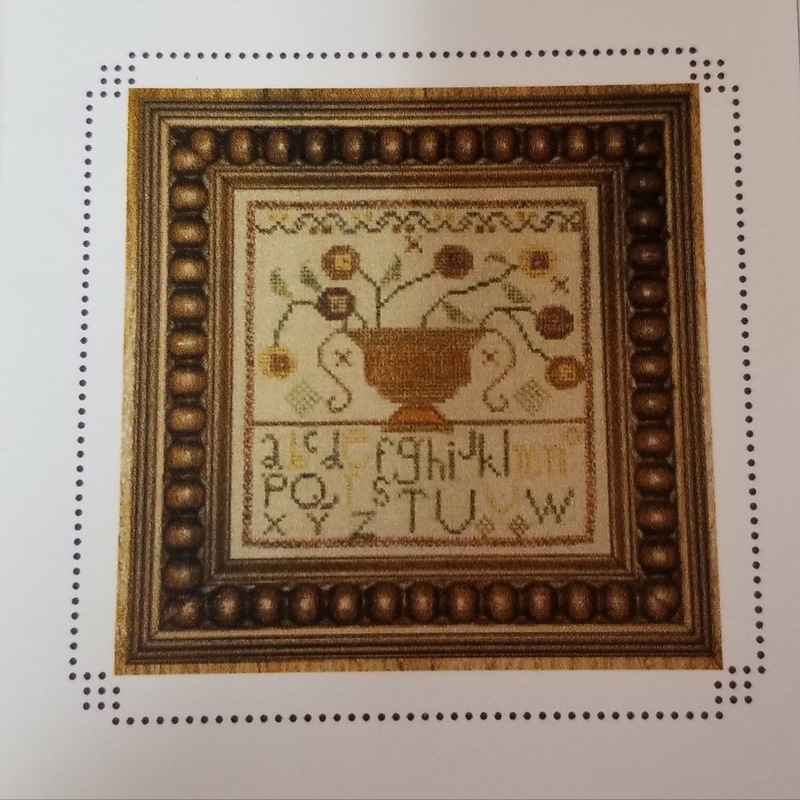 I'm an Aussie living in North Carolina with my husband, two dogs, two corn snakes and my cross stitch, quilting and knitting stashes and craft book collection. Stash diving is a delight, as inspiration can strike at any time....day or night!